Africa Hunt Lodge offers hunting packages for all Seven (7) of the Dangerous Game you can hunt in Southern Africa. Hunt for Southern White Rhino in South Africa (exportable to the US and abroad). Hunt for South African Cape Buffalo at and near our Lodge in the Limpopo Province. 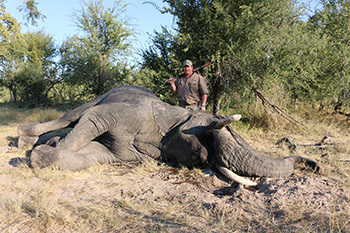 We offer Exportable Trophy Bull Elephant Hunts as well as Management Elephant Hunts which are non-exportable trophy hunts. Hunt for Trophy Crocodile in South Africa (exportable to the US and abroad). Hunt for Trophy Hippo in South Africa (exportable to the US and abroad). Africa Hunt Lodge offers Hunts for Dangerous Game both in South Africa and Zimbabwe each year. Cape Buffalo, Crocodile, Elephant, Hippo, Rhino, and Lion can all be hunted in South Africa. In Zimbabwe, we hunt all of those species as well as Leopard.